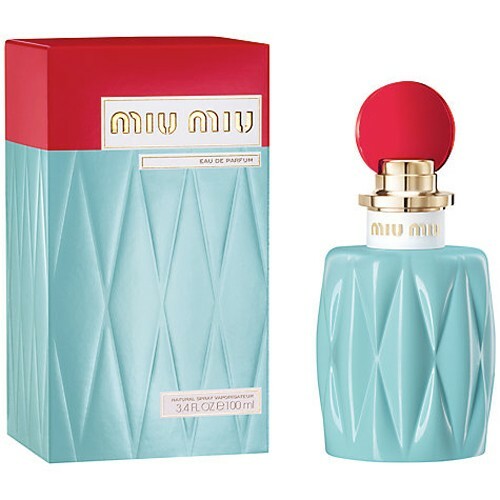 In August 2015 MIU MIU begins the sales of their first perfume Miu Miu which was, according to Caroline Javoy, vice-chairman of marketing at Coty Inc., created as "unique, youthful, bright colors and sophisticated." Miuccia Prada wanted to intertwine the provocative, attractive spirit of the brand Miu Miu into the composition and the design of the fragrance bottle, and the brand of Prada helped develop the first Miu Miu fragrance and to design this attractive flacon. The composition of the fragrance is signed by perfumer Danielle Roche Andrier, known for her creations for the house of Prada (as well as Bvlgari, Marni, Bottega Veneta). As Danielle explains it, the focus is on lily of the valley flowers supported with floral notes of jasmine, rose and green notes, as well as a special ingredient created by Givaudan, akigalawood, which develops the scent of patchouli, notes of pepper and woody aromas of oud. The composition of Miu Miu fragrance opens in a fresh and floral manner, and as it develops it begins warmer and woodsier, says Danielle. AKIGALAWOOD—a fractioned note of patchouli oil which contributes to the pepperish and woody character of the fragrance was created in Givaudan. The house highlights: "The new material has a similar profile as patchouli, combined with vibrant spicy shades of pepper and precious oud wood."